Easy, decadent, low in fat, high in protein, delicious, anti-inflammatory and plant-powered, this recipe offers you lots of options (see below) to customize this treat. This recipe can be easily doubled. Open the silken tofu package over the sink and carefully drain any excess water before using. Combine all ingredients in a blender or food processor and thoroughly blend on high speed for at least two full minutes until smooth and creamy stopping to scrape down the sides mid-way. Pour the pudding into dessert cups or parfait glasses and garnish with a mint leaf, a single, fresh berry, non-dairy whipped topping and/or a dusting of cacao powder. Pudding can be kept in the refrigerator for several days. It may require stirring if any separation is noted. Note: Optional substitutes include using melted dark chocolate instead of cacao powder (although this will dramatically increase the fat content), adding warming spices, such as, ginger, nutmeg or cinnamon or replacing the cacao with fresh or frozen berries. To prepare a Berry Pudding, substitute 1-2 cups of fresh or frozen strawberries, dark cherries or blueberries in place of the cacao, use a package of firm tofu and use vanilla or almond extract instead of peppermint flavor. 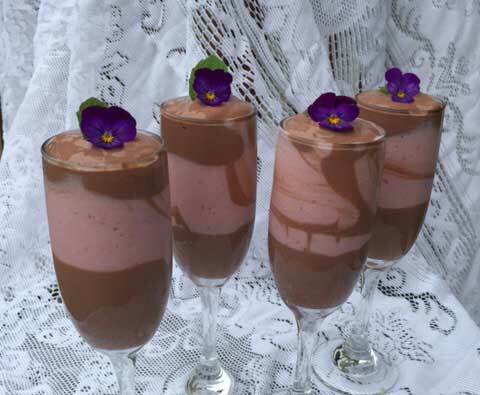 Preparing a batch of cacao pudding and a batch of berry pudding and layering them in parfait glasses makes a delicious and beautiful dessert for yourself and company. Recipe courtesy of The Key to Balance. Chef Jeanne Tennis, a vegan chef and certified macrobiotic health coach who operates The Key to Balance in Farmington, is teaching four-week cooking classes on anti-inflammatory diet at Hartford HealthCare’s Bone & Joint Institute. To register for the next series, call 1.855.HHC.HERE (1.855.442.4373).